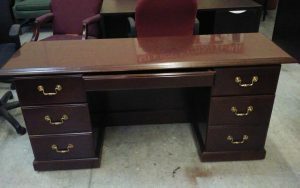 When it comes to buying an office desk or any other furniture pieces for your business in Canton, Georgia, you won’t want to look further than NorthPoint Office Furniture. Since 1994, our family-run company has specialized in selling new and used office furniture for commercial and home offices. Not only do we sell top-quality pieces, we also offer all manufacturers’ warranties, helping give customers peace of mind that their investment is protected. Customers who want to see these and our many other pieces are encouraged to visit our 8,000-square-foot showroom in Roswell, which includes fully staged displays to help you envision how our furniture will look in your office. Individuals who would prefer to purchase their new office desk and any other furniture from the comfort of their own homes will be happy to know that our website inventory is frequently updated, so they can remain informed on the pieces we have available. NorthPoint Office Furniture is proud to offer our customers in Canton, GA, a variety of services to go along with their office desk purchase. For example, we can deliver and assemble your new furniture, as well as assist you with space planning. To learn more about the different ways we serve our customers, contact us today.